This very small lake has been long forgotten by most Tornado’s guests (and unknown to the rest of us until recently). A shallow lake with rocky shorelines, it is home to numbers of smallmouth bass and some largemouth as well. This is a “quantity, not quality” lake, but great for canoeists or a temporary diversion. Accessible from Mud Lake – not far from the Doe Lake lift – the portage is short (less than 100 m), but you will have to take a canoe along with you. Lost Lake merits about 2 hours fishing time, and on an adventuresome day, could be combined with a trip to Doe Lake, Mud Lake and / or Clear Bay. Without much in the way of shoreline cover or weeds, this is a good place to fish topwater plugs, small crankbaits, twitchbaits and plastic worms. Our best results came when we move off the bank a bit where the breakline created structure to which bass could relate. 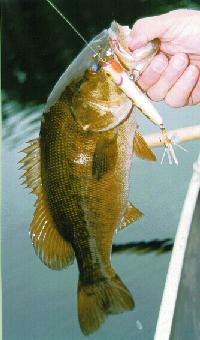 Downsize your baits a bit for non-stop action.